Black Sand Assassin | Rollespræll! 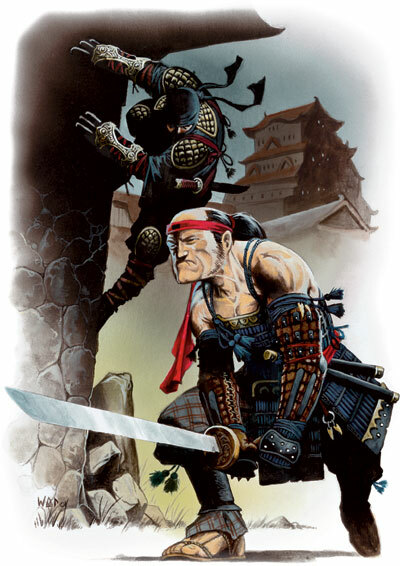 The members of the Black Sand Clan are all orphans who are brought up at the secret headquarter of the clan and only released into the world when they are ready to start serving the Clan by assassinating all and any targets the Clan is hired to deal with. Bonus: Black Sand Assassins are proficient with all exotic weapons, and have +1 hit/dmg/crit range/crit dmg with all exotic slashing weapons. Hindrances: You can never leave the class. Nor can you combine it with any other classes, since it occupies all 4 class types. Major spheres: Any 4 spheres (pick yourself). No minor spheres. Assassin Strike (Ex): Backstab bonus is applied to the first attack of every round, +1 hit/lvl on that first strike. Sharp Strikes (Ex): Cut a limb on a critical hit on slashing attacks. Strong Magic (Su): Your magic ignores half the MR of your target. Hail of Stars (Ex): Standard Action: Throw 1d4+1 pr. 4th lvl small darts (each dealing 1d4 dmg) on every eligible target within 30 feet. You get one target pr. 4th level. Puncturing Strikes (Ex): Your slashing attacks ignore half the DR of your target. Crippling Strikes (Ex): The damage from your slashing attacks cannot be healed by Fast Healing or Regeneration. Improved Shadow Walk (Ex): Undetectable while using MS/HS. Magical detection does not work, neither does Scent or Dragon Senses. Stronger Magic (Su): Your magic ignores half the SR of your target. Improved Hail of Stars (Ex): The stars deal an additional 1d4 dmg, and the radius doubles to 60 feet. Fast Reflexes (Ex): +4 initiative, +4 on all DEX checks. Improved Whirling blades (Ex): All your attacks are Whirlwind attacks. Armorpenetrating Strikes (Ex): Your slashing attacks ignore the armor of your target. Critical Vorpal Strikes (Ex): Your slashing attacks beheads opponents on critical hits and deal regular critical hits to those who are normally immune to critical hits.